The intersection at Main Avenue and Wall Street is closed off as the Saad Building is demolished to make room for Urban Outfitters. The summer season is also the peak of construction season, a period that runs from March through October, when developers can break ground, move some dirt and erect some buildings just in time for the weather to turn to biting cold. 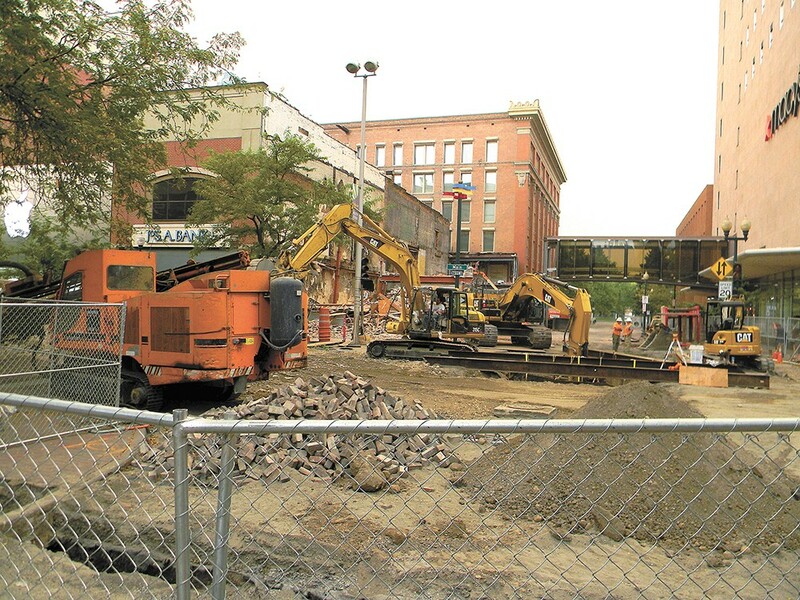 The recession of 2008 stalled some development in downtown Spokane. But with the economy on the upswing, new life is being breathed into vacant lots in downtown Spokane and national retailers are deciding to set up shop in the Lilac City. According to city records, 50 active building permits have been issued to downtown businesses for remodeling or renovations to buildings. Some are minor, but others could be groundbreaking. More are on their way. The lot at Division Street and Third Avenue has been vacant since 2008 after plans for a new hotel fell through during the recession. Since then, it's been an eyesore, with rebar and other remnants of the halted hotel as well as garbage strewn about, says Brooke Baker, project innovator at Baker Construction & Development, Inc., which is working on a new development there. Beginning next year, the empty lot will be a new, mixed-use, 16,000-square-foot building dubbed Peppertree Plaza. The bottom floor of the new building, says Baker, will host an Einstein Bros. Bagels and will be a new location of the Man Shop, a local chain of male-oriented barbershops. The top floor, says Baker, will be the corporate offices of Best Western Peppertree, a chain of hotels in Washington state. Baker says that work ripping up the foundation began in July; she hopes to have most of the work complete by December. Tenants, she says, will move in early next year. The once-neglected lot, near the I-90 exit, was one of the first things to greet visitors to Spokane, and the city welcomes the new plaza. "That's a good development," says city spokesman Brian Coddington, "because that's been in need of a tenant." In February, the Spokane Public Facilities District threw open the doors to its new Spokane Convention Center. Now, the PFD has commenced work on another project, also on Division Street, intended to give visitors to Spokane a better first impression. The PFD is working on making the triangle at the corner of Division and Spokane Falls Boulevard less of an eyesore. The city of Spokane has been working on gateway projects near exits on I-90, with the goal of giving visitors an improved first impression of the city, and the PFD is hoping to do the same with the triangle, says Kevin Twohig, CEO of the PFD. "We were anxious to have one near the Convention Center done, because it's the gateway to the convention center," Twohig says. Previously just an asphalt island with jersey barriers, the gateway will include plants that mimic the color of water, along with blue ash, dwarf Douglas fir and Vanderwolf pines. In the center will be Dance of the Redband, a sculpture of a trout leaping from the water by local artist Ken Spiering. Twohig hopes that the gateway will be finished by October. 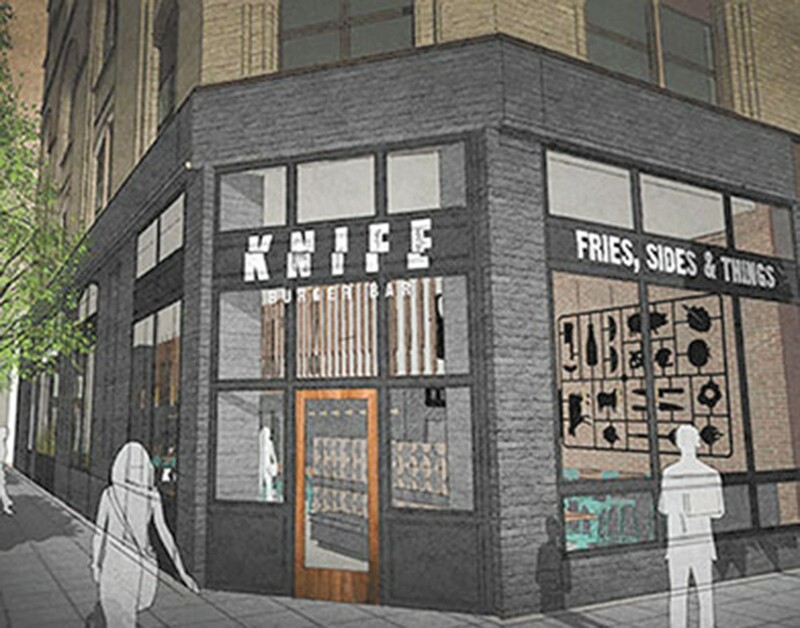 A rendering of what the future Knife Burger Bar might look like. Spokane real estate magnate Jerry Dicker announced earlier this week that he had purchased the Montvale Hotel, the city's oldest hotel — it opened in 1899 — in a foreclosure sale made two weeks ago, and will begin renovations on it. In 2013, its owner, Rob Brewster, filed for bankruptcy and the hotel went into receivership. As a result, Catacombs Pub and Scout, two restaurants inside, ended up closing. Dicker is known for purchasing and renovating two downtown hotels, dubbed Hotel Ruby and Ruby2 respectively, under his Ruby Hospitality boutique hotel brand. Last month, he acquired Dempsey's Brass Rail bar, which closed in 2011. The Montvale, under Dicker's ownership, will undergo upgrades, including a lobby expansion that will include a new coffee shop, as well as renovations to the original skylights. All mechanical systems in the 36-room hotel, including the air conditioning, will also be replaced. "We are big believers in downtown and we want it to prosper," says Dicker. Scratch Restaurant and Rain Lounge are expected to remain tenants on the first floor, and Dicker plans on opening a new restaurant in the building's old boiler room in the basement. In mid August, Walker Construction, Inc., put up fences blocking off the intersection of Wall Street and Main Avenue and workers got busy on demolition of the Saad Building, previously home to a shoe repair business, to make way for a new location of the national clothing retailer Urban Outfitters. City and business leaders undertook extensive negotiations that included the city handing over control of 17 feet of the right of way to the national retailer. Currently, the intersection is covered with heaps of rubble and dirt as workers continue demolishing the building. Tara Severns, assistant project manager at Walker Construction, says she's not sure when the street will reopen, but most of the work for the new 10,000-square-foot building should be done by May of next year. Earlier this year, construction began just down the street from the future site of Urban Outfitters on the Main Avenue building that once contained the Mobius Science Center. The space will host Anthropologie, an upscale retailer of women's clothing. Bryn West, general manager at River Park Square, says that getting the retailer to agree to come to Spokane was a coup — representative, along with Urban Outfitters, of downtown's revitalization. "They are very picky about where they locate," West says. "It took me four-plus years of convincing." West says that Anthropologie will be opening next week, on the firm date of Sept. 4. The 12,000 square feet of space will accommodate a full-size Anthropologie, not a smaller version of the store. West says that another store called &Kloth will open about the same time, on the same street, as Anthropologie, and will also sell women's clothing, jewelry, accessories and home items. She says the new store will be owned by Tiffany Mulgrew, who owns Fringe Salon & Boutique, and will include a coffee stand up front. The Washington Cracker Co. building, a red-brick structure at 304 W. Pacific Ave. near the train tracks downtown, was originally built in 1891 to make crackers, bread and candy. Over the years, it changed hands, eventually becoming a storage space for a moving company and remaining unoccupied for the better part of the past decade. But that's all going to change soon, says Darby McKee, managing member of Cracker Box LLC, the company that took over ownership of the building last year. McKee says that the building will be multi-use, with office space on the second and third floors and retail on the main floor. He says that tenants are moving in, and next month Anvil Coffee Roasting will open up a coffee shop, where they will roast their own beans. Overbluff Cellars, a winery, will also open up with a tasting room, he says. The main floor also will include a permanent art gallery that will be operated by Terrain, a local arts nonprofit, says the group's co-founder Luke Baumgarten. Downstairs will also include a 5,000-square-foot event space, and upstairs a coworking space upstairs for small businesses and freelancers. "It's becoming a cool little corridor with wineries and distilleries and yoga studios and a creative district," says McKee of the surrounding area. "We love the [building's] open spaces and the high ceilings." The building is listed on the Spokane Register of Historic Places, and McKee says that his company will retain its historic features as it's renovated. McKee also says that the parking lot was a bonus, especially downtown. After Agave Latin Bistro closed its doors last year, HDG, a design company that's been involved with the design and renovation of local restaurants, said it would put a new eatery called Burger Lab in its place. HDG has been known for designing spaces characterized by openness, unique textures and seamless transitions between indoors and outdoors.